System 2000 Group were tasked with designing, manufacturing and installing a hand guard shutter for a carousel at Jaguar Land Rovers’ plant at Castle Bromwich. After an initial survey, a manual hand-operated shutter was designed using CAD by our in-house design-engineer. Calculations were performed to ensure the shutter would be light enough to be operated manually, and strong enough to withstand daily use in a factory environment. 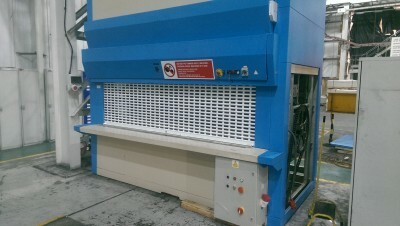 The design was then sent to our works where our shutter engineers built the shutter, ready to be fitted to the carousel. The shutter was transported to site from our Birmingham works, fitted to the carousel and tested rigorously for smooth operation.